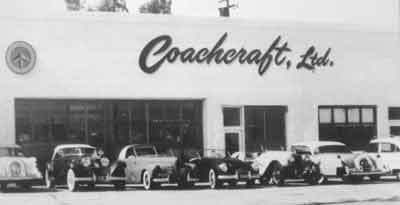 Coachcraft, the last classic American Coachbuilder, was formed by three ex-employees of Howard "Dutch" Darrin when he sold his California operations to Packard and closed up on August 1,1939. The men, Burt Chalmers, Rudy Stoessel and Paul Erdos, established Coachcraft, Ltd. at 8671 Melrose Avenue, Hollywood, California, in the spring of 1940. This sadly coincided with the twilight of their trade, personifying this chapter in their illustrious, but financially rocky, story. Unlike their predecessors who specialized in coachbuilding bodies upon luxurious chassis such as the Duesenberg and Rolls-Royce, Coachcraft gained a reputation for applying their trade to lower-cost Ford, Mercury, and Studebaker chassis as well as to the more up market models, Packard in particular. Each of the three men had his particular specialty. Burton K. Chalmers was the front man who'd sold for Cadillac, Citroen Renault and Packard-Darrin. Burt created the Coachcraft image and had Hollywood connections, so necessary for a business of this kind. Hungarian Paul Erdos was the metal shaper who clothed Rudy Stoessels's ash frames. It was Rudy who was the magical ingredient that sustained the company through four decades of changes. Born in Bavaria in 1907, Rudy began an apprenticeship for cabinetmaking at age 13. In 1926 he followed his brother to Buffalo, New York where he found employment in a planing mill. HE then moved to a job in Pierce-Arrow's experimental department where he began building prototype body parts in wood. Here Rudy began to understand his talent. When the job ended in 1929 , Rudy moved west where he was lucky to be hired by J. Gerald Kirchoff who had left the Walter M. Murphy Company to form his own coachbuilding company. At Kirchoff's in Pasadena, California, Rudy helped to build a boattail speedster body atop a Harry Miller-designed chassis and here he met and began a 30-year friendship with Paul Erdos. Burt worked on and off for Kirchoff and Fuller, a Southern California Auburn-Cord-Duesenberg distributor, before the Depression put him out of work. Meanwhile Howard "Dutch" Darrin decided to produce a European-style sports car on a sturdy and reliable American-made chassis - a theory adopted to great effect three decades later by Carroll Shelby. Darrin's choice of chassis was the small 8-cylinder Packard, but what made the car different was its use of a revolutionary Stoessel-developed cast aluminum cowl which formed the internal and external transition between the hood and the body. Rudy was likewise responsible for the patterns for the cast windshield posts, doors, and seat frames which substantially reduced construction costs. Sadly only about 15 of these cars were built before Darrin sold out. One of the first cars Coachcraft Ltd. built was started late in 1940 and finished in1941 for its designer Peter Stengel, heir to the Bache family fortune, with a price tag of $6,000. According to Rudy's son Bill, who, as of this writing, still operated Coachcraft, Stengel's car was a complete ground-up job built on a 1939-40 Ford truck chassis and fitted with an Eddie Meyer-tuned flathead Ford V8. About the same time, Coachcraft also customized a '40 Ford for Clarence Solomon. It too had a radically reworked body featuring new doors, a sectioned hood, a custom windshield and extended, although not fadeaway, fenders. Unfortunately, as the rising sun of Japan set its sights on conquering the world, the sun had all but set on the craft of coachbuilding and Coachcraft had to move with the times to survive. It was Rudy's talents that enabled the company to adapt to market trends. Over the years, Coachcraft tried its hands at everything from continental kits and roof racks to cars that carried wheelchairs. In the 1940s and 1950s, they were also known for their exemplary woodys and their woody business became so prolific that the shop was re-titled "Station Wagon Harbor". 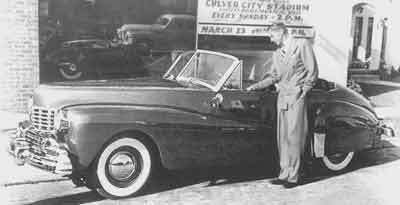 Burt's contacts had always afforded him an entree into Hollywood where movie stars such as Preston Foster and Charles Starrett, among others, desired distinctive station wagons. Consequently Coachcraft had Douglas Aircraft designer and engineer "Buzzy" Peterson draw up initial sketches for them. Based on a 166-inch wheelbase 1940 Studebaker ambulance chassis, Foster's vacation wagon presented a distinctive ash-framed body that housed a uniquely innovative package utilizing every inch of space for camping equipment. For example, the decklid raised to reveal a sink with draining board, a gasoline stove, a refreshment cabinet, shelves for supplies and a refrigerator. The latter was powered by a small gasoline motor situated behind the grille between it and the radiator. The motor also provided 110-volt power for the interior lights. The seats folded down to form a seven-foot bed and a tent, raised on telescoping poles completely enclosed the rear and side of the vehicle. There was even a primitive form of air-conditioning, as well as a long-distance, short-wave, two-way radio. Although far less practical, the Starrett wagon was in some ways more stylish but although Charles Starrett was a popular western star, the wagon received far less publicity. Based on a '41 Cadillac chassis, Starrett's woody featured a two-door body with a beautiful, curvaceous back that mirrored the Art Deco style of Cadillac fenders. Strangely enough, and ad in the January 1957 issue of Motor Trend stated that Coachcraft had purchased the wagon back from Starrett and had it up for sale for the now-ridiculous price of $1,500. Another vacation wagon, built for Walter Dupee of Bel Air in the late 1940s, sported a hand-formed aluminum top, a '49 Mercury motor and Helvig adjustable springs. Dupee's wagon even had a special boat rack on the roof. A similar wagon was also built for Don Bleitz, mounted on a Marmon-Herrington four-wheel-drive chassis with metal compartments beneath the flooring fir additional storage. Such was Coachcraft's reputation that in 1946 Henry ford commissioned them to build a car based on a Mercury chassis, featuring a custom body employing 1940 Zephyr rear fenders and a '46 Continental front sheet metal. It previewed a not-yet-introduced '49 Lincoln flathead, and another three-piece padded hardtop. Coachcraft also did some work on the famous 1949 Cadillac Woody limousine designed by fellow LA coachbuilder Maurice Schwartz for Mexican president Miguel Aleman. The vehicle featured a Coachcraft roof rack and apparently was built using a stretched Series 62 Coupe. They also built a custom 1951 Cadillac series 62 wagon for Minneapolis contractor Merrill M. Masden. LA stylist Philip Wright designed the Masden wagon for Coachcraft and is thought to have done other work for the firm as well during the 1940s and 1950s. 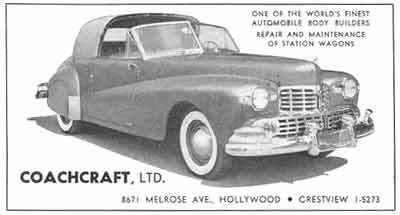 The cars and woodys produced by Coachcraft both immediately pre- and post- World War II had a lasting impact on the automotive world. The were featured regularly in contemporary magazines and the modifications employed in their construction heavily influenced others in the business. Unfortunately, the aftermarket automotive business was fickle or at least the customers were, and Coachcraft was forever searching for and applying itself to the latest trends and fads. However, as the woody waned, Coachcraft continued to apply roof racks to factory woodys and stations wagons throughout the 1950s. Station Wagon Harbor also advertised that they repaired/replaced damaged wood panels on Ford and Mercury Sportsman, Chrysler Town & Countrys and other wood-based station wagons. Although the three founders have died, the son of Rudy Stoessel continues to operate Coachcraft and has moved the operation from West Hollywood to Morepark, just north of Los Angeles.